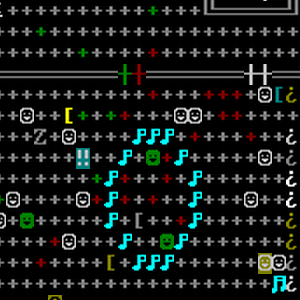 An attempt at creating music matching the procedurally generated description of the music of the dwarves in a Dwarf Fortress game. This is supposed to be an example of The Paints of Jade, which is a specific musical form that accompanies a religious dance in honour of Athser, the dwarven god of the sky and rainbows. Athser usually takes the form of a cave swallow and some of the movements of the circular cakewalk-type dance are meant to imitate that bird's flight. Performed on the thur reed organ and buqui drum set. The dwarves might not actually use the buqui when doing the dance in their temple, but the sound of their feet would create a similar effect, and it's likely that dwarven musicians would use a buqui when practicing the music without dancers. More detailed description to be added later. Sheet music available (PDF file).